This recipe is from the More-with-Less Cookbook (put out by the Mennonites). Rob has been using a Joy of Cooking recipe to make bread every once in awhile but he couldn't get it to rise properly. 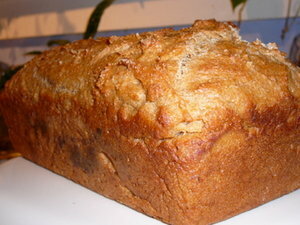 He tried this recipe yesterday and the bread rose wonderfully and tastes delicious! Combine the 3 cups of flour, sugar, salt and yeast. Heat 2 c. water along with milk and oil in a saucepan until warm. Combine dry ingredients, warmed liquids and 2 eggs. Beat at low speed until moistened. Beat for 3 minutes as medium speed. Stir in by hand 5 - 6 cups additional flour. Use enough flour to form a stiff batter. Cover and let rise until double. Stir down and spoon into 2 greased 9x5" bread pans. Let rise 20-30 minutes. Bake at 375° F for 35 - 40 minutes. Tastes great with butter and honey slathered on top. well, i don't know. i suppose it depends on what you mean by dense bread. if you're comparing it to the fluffy wonder type stuff then yeah, it's dense. but compared to the bread i usually buy at the store, it's about the same... maybe a little denser but not a whole lot. It made for nice sandwich bread. I am from Australia and had to convert this recipe into metric measurements. So I thought I would add it to your page just in case there are others looking for the metric conversion. Thank you kindly for the recipe I am a big lover of bread of any kind. At those amounts I'd prefer a weight measure rather than volume since flour can be compressed or aerated. i would say use more of whatever kind of flour you're using. just remember that this is going to be kinda goopy. my mom tried making this once and thought it was too wet, so she kept adding more flour. ... it came out pretty rock solid. When the recipe calls for 5-6 c.more flour, is it whole wheat? i'm pretty sure that when i saw the original recipe, it called for white flour. but we grind our own grain, so i always use whole wheat in whatever i'm making. i'm sure it comes out just fine either way. yup, just checked the recipe and it definitely calls for both.